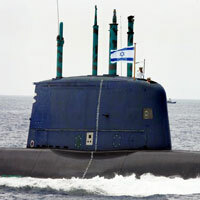 Israeli Dolphin-class submarines, made in Germany, contain nuclear warheads. Israel has a maritime nuclear capability, and Israeli politicians and military officials are praising German-Israeli military cooperation: "Germany is helping to defend Israel's security. The Germans can be proud of the fact that they have secured the existence of the state of Israel for many years to come." Unlike any other submarine in the Western world, the Dolphin-class subs have not only torpedo tubes 533 mm in diameter but also four additional tubes 650 mm in diameter. Israeli arms company Rafael developed Popeye Turbo cruise missiles for submarine deployment. They are said to have a range of 1500 km and carry a 200 kg warhead from the undisclosed Israeli nuclear arsenal. The Israeli U-boat deterrent is proof that Israel could respond to a nuclear attack with equally devastating firepower. For the tiny state of Israel, which could be wiped out with a nuclear strike, safeguarding this second-strike capability is vital. Defense Minister Ehud Barak says the submarines are the military response to the threat in a region "where there is no mercy for the weak." They are Israel's insurance against the fear that "the Arabs could slaughter us tomorrow," as David Ben-Gurion, the founder of the State of Israel, once said. The German government has always pursued an unwritten rule on its Israel policy. Former Chancellor Gerhard Schröder summarized it in 2002: "I want to be very clear: Israel receives what it needs to maintain its security." Arms shipments began by 1958. The equipment included helicopters, transport aircraft, tanks, guns, and missiles. In 1967, Israel preempted an attack by its neighbors and achieved a brilliant victory in the Six-Day War. From then on, Israeli politician Shimon Peres consistently reminded his colleagues not to forget "what helped us achieve that victory." In the 1960s, Peres took responsibility for Operation Samson. The goal of the operation was to build an atomic bomb. The Israelis told their allies that they needed cheap nuclear energy for seawater desalination, and that they planned to use the water to make the Negev Desert fertile. Israel was short of money, so Ben-Gurion negotiated in secret with Adenauer over a loan worth billions. Ben-Gurion said the loan was for an infrastructure project in the Negev Desert. There was also talk of a desalination plant. But a desalination plant operated with nuclear power was never built. Israeli historian Avner Cohen: "Everything seems to suggest that the Israeli bomb was financed also with German money." The Israeli government dismissed questions about its nuclear arsenal with a standard response that stems from Peres: "We will not introduce nuclear weapons to the region, and certainly we will not be the first." Chancellors Willy Brandt and Helmut Schmidt approved Israeli plans to buy German U-boats. In 1977, the last of the first three submarines arrived in Haifa. At the time, nobody was thinking about nuclear second-strike capability. But a few years later a discussion began about modernizing the Israeli navy to pursue the nuclear option. Weeks after the fall of the Berlin Wall in 1989, the German government quietly approved the construction of two Dolphin-class submarines for Israel, with an option for a third. During the 1991 Gulf War, the German government agreed on a huge arms deal for Israel that included financing for two submarines. In 1994, Chancellor Helmut Kohl and Israeli Prime Minister Yitzhak Rabin discussed the Mideast and Rabin asked Kohl for a third submarine. Kohl agreed and the contract for the third submarine was signed a few months later. Israeli Popeye Turbo cruise missiles are easy to mount in the Dolphins. German U-boat manufacturer HDW equipped the Israeli submarines with a special hydraulic ejection system instead of a compressed air ejection system to push the missiles out of their outsize tubes. The Germans prefer not to know: "In politics there are questions that it's better not to ask, because the answer would be a problem." Israel has considered using the Samson option at least twice in the past. In 1973, following the Egyptian and Syrian surprise attack during Yom Kippur, Prime Minister Golda Meir had several nuclear bombs delivered to air force units on instant readiness. Then Israeli forces rallied and the bombs went back to their bunkers. And in 1991, at the start of the Gulf War, Iraqi Scud missiles bombarded Israel and Prime Minister Yitzhak Shamir responded by mobilizing its nuclear force. On his last working day in office in 2005, Chancellor Gerhard Schröder approved the delivery of submarines number 4 and 5. When the German Finance Ministry reported on their financing in 2006, ministry officials said the subs were "not suitable for the use of missiles equipped with nuclear warheads." Chancellor Angela Merkel is happy to support Israel. Violating German arms export guidelines, she made a deal for the delivery of submarine number 6. The contract was signed in March 2012. Germany gave a discount of €135 million, a third of the cost, and let Israel defer payment on the rest until 2015. These latest subs feature fuel cell propulsion that lets them run silently and submerged for many days, much longer than the previous Dolphins. So Iranian bunkers are now in range for Israeli nukes, thanks to German engineering. AR This is a fine example of defense and business solidarity in action.